Zouk is a brand that's weaving all our Ikat dreams to life with their gorgeous wallets, handbags, laptop bags, backpacks and travel pouches. These bags are 100% vegan, and come in the prettiest designs. If you're someone who's as crazy about Ikat as we are, you'll definitely love Zouk's accessories. With clean designs that show off their beautiful prints, their products are dedicated to different patterns while keeping the traditional art alive. They've got laptop bags, handbags for women, backpacks, wallets and passport cases. These are all made out of vegan leather, jute and Ikat, and come in monochrome patterns as well as colourful ones. They're getting full points for their website, it's got clear, detailed images of their products, and all your essential details without any fluff. Besides floral and Mughal motifs, they've got dotted bags, some with abstract art, and more designs. 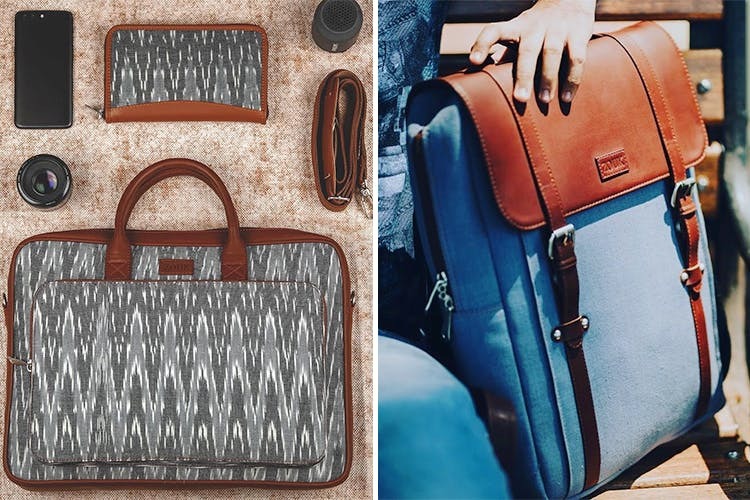 What's even better are their prices—they're pretty decent, wallets start at INR 650, handbags and laptop bags start at INR 1,800 and travel pouches start at INR 1,200. They're much more economical compared to a lot of brands doing the same kind of products. We wish they had some more designs for their backpacks—they're all solid colours and look nice, but we'd like to see some more prints here. They have a monsoon sale going on, so check out their stuff before it gets over.